Florence moved a significant portion of sand offshore, but post-storm waves immediately began the slow process of bringing it back. Dunes on the beach at Emerald Isle. Photo courtesy of VisitNC. Months after Hurricane Florence made landfall on Wrightsville Beach, much of eastern North Carolina is still in recovery. Although Florence’s ocean storm surge was lower than some previous hurricanes’, the tropical system sat on the shoreline for an extended period of time, bringing significant flooding from record rainfall and estuarine storm surge. As spring arrives, some oceanfront stretches still show signs of Florence, like extensive dune and beach erosion, and damaged or newly replaced walkways and dune crossovers. The destruction evokes images of some of the worst hurricanes North Carolina saw in the 1990s. Almost exactly 22 years before Florence, Hurricane Fran made landfall near Cape Fear. 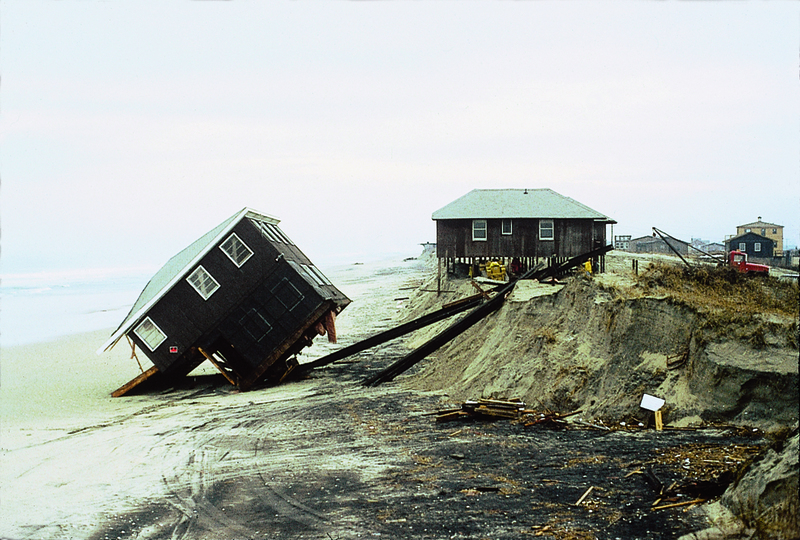 In 1996, Hurricane Bertha already had damaged many of the dunes from Cape Fear to Topsail Island, with Bogue Banks and Brunswick suffering moderate dune erosion but minimal building damage. In much of the primary impact area, Fran then overtopped and eroded many of the dunes that had remained. The combination of the 1996 storms was worse than Florence on the oceanfront, but the restoration of the dunes after the 2018 hurricane season will entail a similar slow process. 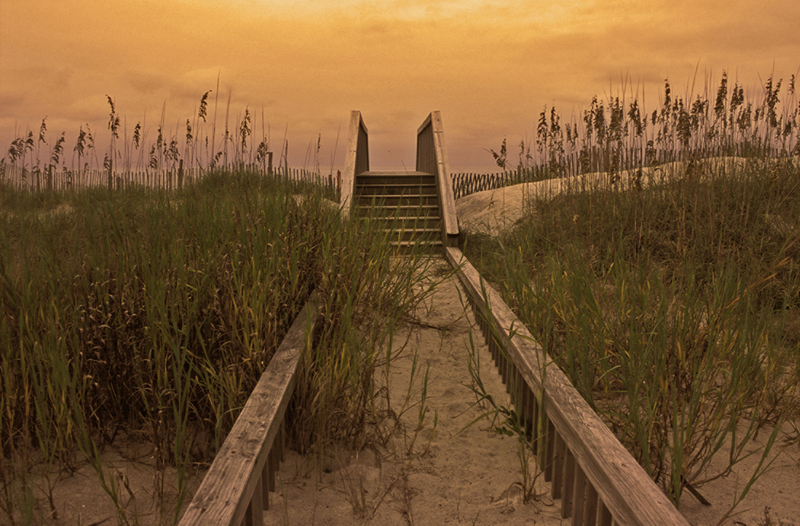 Dune walkover at Topsail Beach. By Scott D. Taylor. Spencer Rogers, North Carolina Sea Grant’s coastal construction and erosion specialist, says that storm- induced erosion can seem alarming, but North Carolina’s beaches already have started the process of restoration. However, he adds, it is difficult to predict when the dunes will have made a full recovery. Although expensive, beach nourishment — bringing in sand to plant dunes or to widen the beach artificially — can speed up the process. 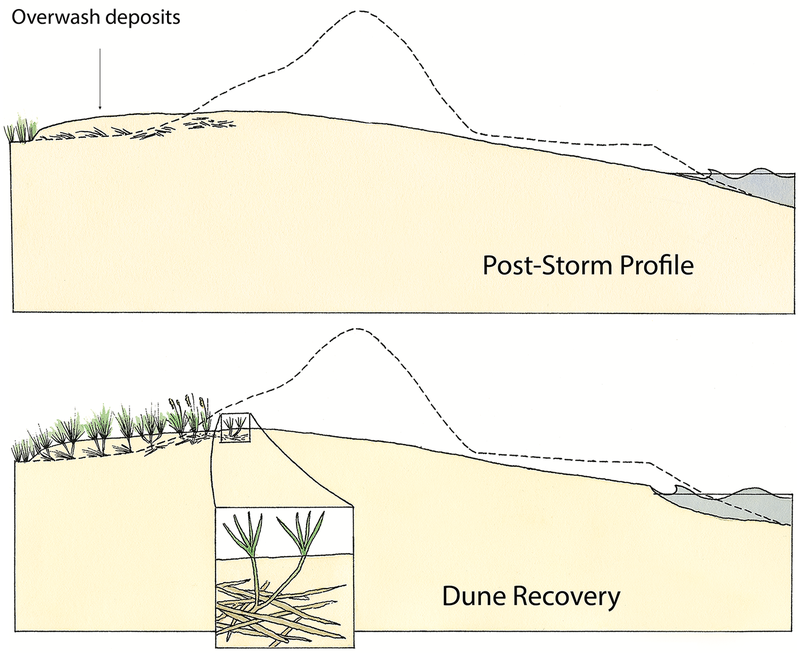 Understanding the erosion and recovery processes of dunes, as the authors explain here, can inform decisions on many aspects of post- hurricane recovery. To understand the dunes, we first must understand how the beach works. Ocean waves dominate the beach. Waves absorb energy from the wind. Stronger winds and larger storms create larger waves. That energy is transmitted across the water surface by the waves to the coast where the waves break, unleashing that energy on the beach. Wave forces are very misleading. Most people avoid hurricane winds of 125 miles per hour. Yet the force of a single 1.5-foot breaking wave on a solid, vertical wall is at least three times more powerful than the winds of a major hurricane. Fortunately, our relatively thin bodies let the water forces go around us, allowing people to play in the surf. The most important protective feature of the beach and dune system is the submerged offshore slope. As a wave moves into shallower water, friction-like factors internally affect the wave form, slowing the base of the wave but having less effect on the crest or top of the wave. Figure A. Shallow water causes waves to break. The decreasing depth causes the wave to increase in height, slow in speed and become much steeper. At some point, the crest of the wave is moving too fast for the bottom of the wave form to keep up. Then the wave becomes unstable and breaks, dissipating part of its energy before reforming into a smaller wave. This depth-induced breaking is a relatively predictable wave phenomenon that can be measured on any beach or reproduced in the laboratory wave tank. This description assumes the wave will break when the water depth is roughly equal to the wave height. More precisely, the waves break when the wave height — crest to trough distance — is about 78 percent of the water depth (Figure A). The offshore slope protects the beach and any coastal development from the largest waves. By the time the waves reach buildings on the shoreline, they are usually smaller than 6 feet, even in a hurricane. The shape of the beach is no accident (Figure B). The primary factors that affect the beach shape on most days include: the wave height during the last week or so; the water level, including astronomical tide conditions and recent storm surges; and the grain size of the sand. Higher waves shift sand from the berm into deeper water, flattening the beachface. Smaller waves move sand back to the berm and steepen the beachface. When higher astronomical tides or small storm surges raise the water level, smaller waves can cause as much erosion as larger waves at normal water levels. On any individual beach, the grain size distributions are relatively constant— but they can vary significantly from beach to beach. Fine sands result in flatter beaches. Coarse sand results in a steeper beachface. If ocean conditions were ever constant, the shape of the beach would approach a relatively constant or equilibrium shape. In nature, wave height and water level are constantly changing. Adjustments in beach shape are critical in providing storm protection for coastal development. Beaches are products of erosion. To make the best dune management decisions, it is critical to understand what type or types of erosion are occurring. Building dunes and planting vegetation can be very effective in treating some types of erosion but totally ineffective for others. Varying weather and storm patterns that reoccur every year cause seasonal fluctuations in the beach width. Between late fall and early spring, a series of “northeasters” occurs across the North Carolina coast. These massive offshore storms cause larger waves and small storm surges that — at least on east-facing beaches — erode the berm. Although no single storm may be particularly noteworthy, they come frequently enough that the berm does not have time to recover during the periods of smaller waves that occur between storms. In contrast, the summer season has fewer and smaller storms, and the berm is usually wider than during late fall to early spring. Figure C. Seasonal changes in wave height and storm frequency cause seasonal fluctuations in the berm. On a typical North Carolina beach, the waterline moves about 75 to 100 feet every year due to seasonal fluctuations. Seasonal fluctuations also cause dramatic changes in the elevation of the beach. When most beaches are at the widest, usually in the summer, you can stand at the seaward edge of the berm at the top of the beachface, and the beach elevation under your feet typically had been 6 to 8 feet lower following the worst storms of the previous year (Figure C). As long as the sand returns for the summer, no one usually worries about the few days when the berm disappears and waves cut to the vegetation line. However, understanding the seasonal loss helps homeowners determine where dune building is likely to be successful. On the other hand, storm-induced erosion is caused during infrequent, but very severe storms, including the worst hurricanes. Large waves are accompanied by a rise in water level or storm surge. The breaking waves create currents along the bottom that move sand from the visible beach to submerged areas farther offshore (Figure D). The average slope of the beach is flattened, spreading out the incoming breaking waves. Initially the berm is eroded, but since the conditions are much worse than the typical annual storm, erosion occurs in the dunes. As with seasonal fluctuations, the overall beach slope tends to flatten by moving sand in the upper beach to shallow water just offshore. As the storm begins, relatively deep water extends to the shoreline, allowing large waves to reach the berm and causing rapid erosion. As more sand is moved offshore, the depth gets shallower, forcing the waves to break farther offshore and gradually slowing the erosion. Storm waves frequently form offshore sand bars. As the waves move into shallower water, currents moving in opposite directions are created along the bottom. Sand is pushed toward the crest of the bar from both directions. The larger the waves, the larger the bar and the farther offshore it forms. Many beaches have one or more rows of offshore bars all year. In those areas, the storm moves the bars farther offshore as sand erodes from the berm and dune, increasing the bar’s size. Conveniently, the bars, with their sand-efficient shapes, cause the waves to break. As the storm continues, the bar builds in height above the original depths. Thus, the water depth over the bar is reduced by the sand supplied by the upper beach. Because water depth controls the wave height, as the bar height builds, even smaller waves are forced to break on the growing bar. Wave heights reaching the upper beach are diminished. Smaller waves result in a slower rate of erosion. The bars act as an increasing filter for the largest waves. Like the seasonal fluctuations, the storm moves the sand toward an equilibrium — a beach shape that after some period of time experiences little additional erosion. Even in the middle of a hurricane, the beach still moves toward a stable shape. A principal benefit for anyone living near the shoreline is that the dune acts as a storage reservoir for sand that is made available during infrequent but severe storms. The larger the dune, the more time it takes to be eroded by the waves, and the more protection it provides to areas farther landward. If the dunes are large enough, the waves and storm surge are prevented from washing across a barrier island. Flooding may still occur from the backside of the island but not directly from the ocean. Even if the dune is breached and the shoreline is overwashed, the sand stored in the dunes and eroded by the storm reduces the incoming wave heights compared to areas without dunes. Both natural and man-made dunes provide significant protection from storm- induced erosion. Figure E. Berm recovery begins immediately after a severe storm. If the offshore sand transport was a one-way path, ocean shorelines would disappear extremely rapidly. Fortunately, most of the sand eroded from the berm and dune moves only a short distance offshore. As the waves and storm surge subside, the beach shape is again out of equilibrium. However, this time the offshore is too shallow. The smaller waves on the post-storm beach shape induce currents along the bottom that push sand back toward the shoreline. Initially, the bar crest begins to move landward, and the berm begins to reform (Figure E). Eventually, the lost sand is pushed back into a new and wider berm. With more time, the dune recovery begins (Figure F). The berm is a feature of the post- storm recovery during average waves and tides. Returning sand is pushed up the beachface, where the water percolates into the surface, depositing the sand it carries. At high tide, daily wave runup pushes sand to its maximum elevation, resulting in a flat berm (Figure G). Figure F. Berm recovery is complete as dune recovery begins. Water and the waves control the berm and offshore area, but dunes are features of the wind, making use of those areas not regularly rearranged by the waves. As the wind speed increases, the sand starts to move. The threshold on a particular beach depends on the grain size and composition of the sand. The finer and lighter the sand, the lower the wind speed necessary to move it. That is why dunes tend to have finer grain sizes than wave-dominated parts of the beach. The sand must be transported to a relatively stable location of beach, landward of the seasonal fluctuations. Finally, to form a dune, there must be some barrier to slow the wind speed below the threshold needed to move the sand; dune vegetation becomes very important. When a dune plant traps sand, it stimulates growth through the accumulating sand that would kill many other plants, ensuring that the plant remains a continuing sand trap for building the dune elevation. Sand fences and other wind barriers trap sand in the same way, but these barriers are unable to expand with the dune like vegetation does. Figure G. Post-storm berm and dune recovery is complete, but long-term erosion deficits move the berm and dune farther landward. The time required for the onshore and offshore movement of sand depends on the severity of the storm. A hurricane may cause severe dune erosion in as little as a few hours, but the sand may take several years to get back to the berm. The slow dune recovery by the wind may take as much as a decade following the worst storms. However, most of the sand eventually returns. In the simplest terms, sand stored in the dunes buys time and protection from the worst storms. The bigger the reservoir of sand, the more time it takes for the waves to consume the dune. By carefully encouraging larger and properly placed dunes, the storm protection can be improved for more landward, natural and man-made features on your beach. Only a few species of plants can adapt to the dunes closest to the ocean and beach, where high levels of salt spray, continuous winds, large amounts of wind- blown sand, and other environmental factors continuously impact these “pioneer zone” species. Coastal dune plants must be able to survive in soils that are low in nutrients and moisture and have extreme fluctuations in temperature and ocean overwash. Dune species thrive in this harsh environment because they are highly adapted to tolerate the extreme conditions. Vegetation aids in forming the dune and plays an important role in the coastal dune ecosystem. Plants trap blowing sand, causingthe formation of sand dunes and the stabilization of barrier island soils. As the dune field grows, multiple dunes line the beach, providing habitat for animals, birds, amphibians and reptiles. Figure H. Salt spray and blowing sand are the two main factors contributing to the zonation of plant species across the barrier island. Salt spray and blowing sand are the two main factors contributing to the zonation of plant species across the barrier island (Figure H). When waves break on the ocean shoreline, salt spray is tossed into the air in high concentrations. Regular onshore winds push the spray inland, coating everything in its path. The highest salt concentrations occur on the beach, gradually decreasing with distance. Dune plants tolerate the highest levels of salt spray and even an occasional overwash by sea water. Most plants have a low tolerance for burial over their stems and roots. In contrast, dune plants thrive on wind- blown sand deposits, and collect sparse nutrients from the incoming sand, stimulating growth and reproduction. The harsh conditions in the pioneer zone allow the dune vegetation to grow without competition from less tolerant plants. Inland from the shoreline and behind the shelter of the dunes, the conditions moderate to allow a wider variety of moderately tolerant grasses, shrubs and trees, resulting in distinctive plant zones forming across barrier islands — from the ocean to the estuary. The older dune ridges are farthest from wind-blown sand and salt spray. Plant species with less tolerance for salt spray and other adverse conditions may thrive in the back dune zone, where other plants and dune ridges block the sand and salt spray carried by the wind. Climate is the primary factor limiting the geographic range of pioneer zone coastal plant species. Along the mid-Atlantic coast, the dunes between the Chesapeake Bay and Cape Lookout are the approximate transition zone for several species. For example, sea oats prefer the warmer climate found south of this area and appear to be limited in their northern range by cold temperatures. American beachgrass is the dominant pioneer zone species north of the transition zone, tending to die back when stressed by the hot, dry conditions found farther south. Both species are excellent sand trappers and dune stabilizers. Each species should be utilized in the climate regions where it is best adapted. While the native geographical range of a coastal species may extend for hundreds of miles along the coastline, plants from one end of the native range may not adapt well at the other end of their native habitat. For example, research has demonstrated that the genetic makeup of sea oats — which influences the plant’s hardiness, vigor, seed production, temperature tolerance, growth rate and reproduction — differs from one population to another. Dunes provide protection against storms but don’t prevent long-term erosion. Photo by Spencer Rogers. Since local plants take years to evolve, they are usually best adapted to the climate where they were first grown. For example, South Florida sea oats do not adapt as well in the cooler climate of North Carolina as they do in Florida, and American beachgrass from New Jersey is not well suited to North Carolina’s warmer climate. Therefore, whenever possible, it is always best to obtain dune plants grown from seeds or parent material originating within a 100-mile radius of the beach where they will be planted. Often, however, the need for plants after the worst storms overwhelms local supply capacity, making it necessary to buy stock from farther away. Whether patching the frontal dune adjacent to a beach cottage or planting several miles of a beach nourishment project, the primary goal is likely to be the same: to trap and stabilize the blowing sand so that it will repair or enhance the storm protection that dunes provide. 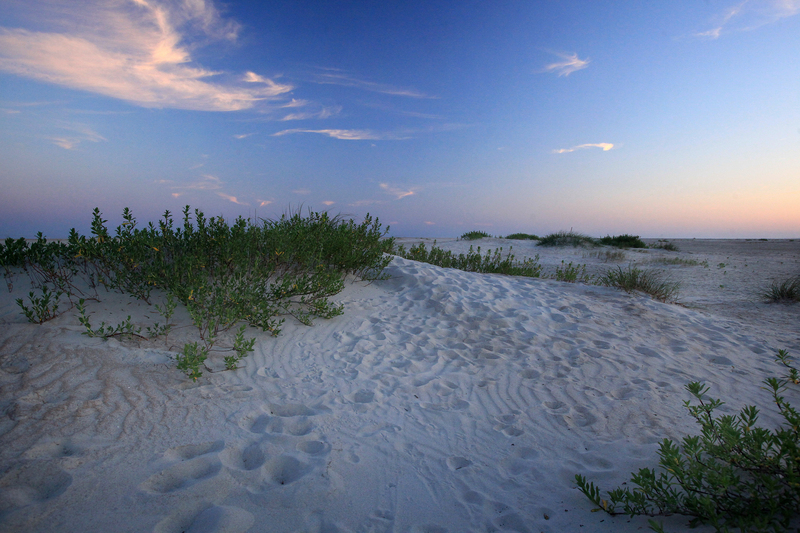 Coastal dune plantings also help build new ecosystems. This is best accomplished by using native indigenous species adapted to the pioneer zone. It is widely accepted that species diversity lends stability to an ecosystem. The difference between environmental restoration and landscape gardening is an important distinction when planning coastal dune revegetation projects, which should include several pioneer zone species. Native grasses and broadleaf plants stabilize pristine dune ecosystems, such as those found on the Cape Lookout National Seashore. Unfortunately, the dunes and plants in developed areas along the North Carolina coast are often destroyed by human impacts. Planting three or more of the pioneer zone species in a dune revegetation project will increase the long-term stabilization of the blowing sand and help the ecosystem recover more quickly. Once the foundation of the pioneer zone species is established, other annual and perennial plants adapted to the dune environment will establish naturally. As the dune system stabilizes and provides food and shelter, birds, animals and reptiles will return to the recreated habitat. Figure I (top) and Figure J (bottom). Surviving plants slide off the face of the eroded dune as the scarp dries and collapses, where plants take root. Dune recovery following a storm usually evolves in several ways, depending on the remaining topography and severity of the storm. During typical seasonal fluctuations in the berm width, the seaward edge of the vegetation sends rhizomes a few feet into the back edge of the berm during the growing season, only to get pruned during the season’s worst erosion. In severe storms — where the dune is not overtopped but a significant volume of sand is removed from the dune — vegetation recovery is usually initiated at one of the three points where remaining vegetation may survive (Figure I and Figure J). The most severe storms may leave remnants of surviving vegetation near the old vegetation line, initiating the most seaward pioneer plants in the next growing season. The near vertical erosion scarp is highly unstable. In the days to weeks following the storm, the moist sand in the scarp dries, and the scarp gradually collapses, becoming a flatter, more stable slope. As the scarp collapses, vegetation from the top of the dune is carried with it. Some of the vegetation survives the slide to the toe of the dune, initiating the recovery over the new slope. Remaining vegetation at the top starts the recovery from above. 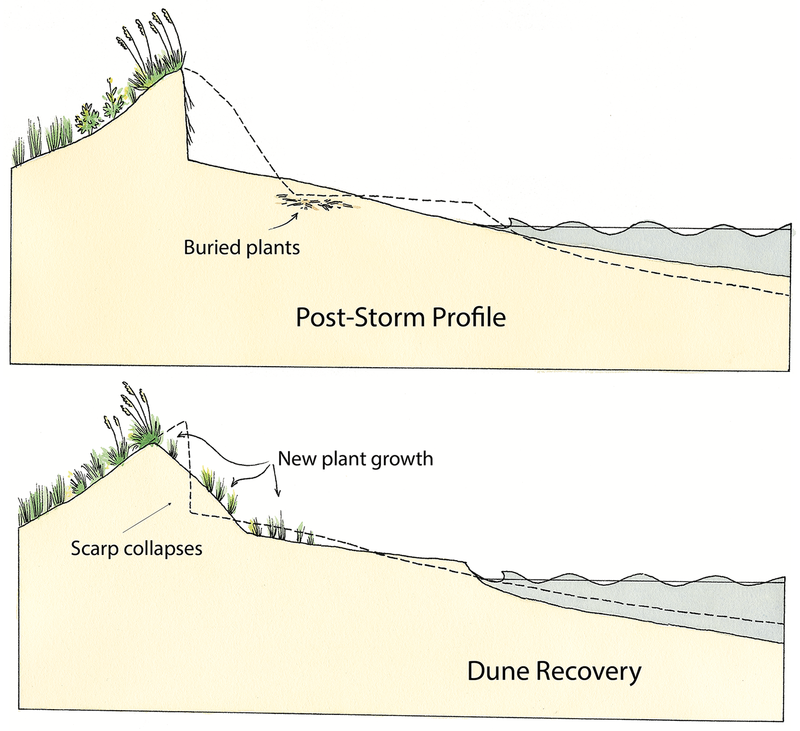 Therefore, on high dunes, vegetation recovery following storms can begin at three locations: surviving plants on the dune top; plants sliding seaward with the collapsing scarp colonizing the toe of the dune; and sometimes, the old vegetation line, if the erosion isn’t too deep. Figure K (top) and Figure L (bottom). After a storm flattens the dune and overwash deposits bury the vegetation, some plants grow through the deposits and initiate dune recovery. On shorelines where the dunes are low and over-topped by the waves, a storm can flatten everything (Figure K and Figure L). The old vegetation line and the dune are eroded, and the vegetation is lost. The waves push overwash sand farther inland, behind the original dune. Farther back, the overwash deposits stop, and the original grasses remain exposed. Dune vegetation has the ability to survive varying depths of burial by overwash. Although the plants seem to disappear following a storm, they can pop up out of nowhere at the beginning of the next growing season and initiate the dune recovery. Buried too deep, the vegetation will not survive, and recovery must start farther landward. Dune plants colonize bare sand primarily by spreading rhizomes or runners from a parent plant. Storms can leave debris deposits or wrack lines that contain a few viable seeds or plant remnants and help jumpstart the dune recovery. The densest clumps of vegetation trap the most sand and are stimulated to grow denser and spread even faster. As the dune grows in height and vegetation density, the area farther landward begins to be affected. By trapping most of the sand in the first dense vegetation, the sand supply to more inland areas is reduced. As the seaward dune height increases, dunes farther landward lose their sand supply and become more sheltered from the wind speeds necessary to deliver the sand. Figure M. Dune width and height increase each season in a seaward direction toward the source of blowing sand. Vegetation and the height of the dune prevent sand from reaching the landward side of the dune. Over time, most dune growth — in both width and height — occurs in the seaward direction (Figure M). During each season, the seaward edge of the dune grows farther seaward, followed by the rising dune crest. In contrast, the landward side of the dune captures very little sand. In this way, dunes grow from landward to seaward. However, at some point the seaward growth is halted when the vegetation line reaches the landward limit of seasonal berm fluctuations. As the slope of the dune face steepens, future increases in dune height slow considerably. Understanding the way that dunes grow in width and height — and their effect on the growth of more landward dunes — is critical in applying the dune and vegetation management strategies.